Liángpí (Chinese: 凉皮) is a cold noodle dish tossed with peanut sauce, chili oil, and vinegar and garnished with refreshing garnishes such as julienned cucumbers, cilantro and bean sprouts. 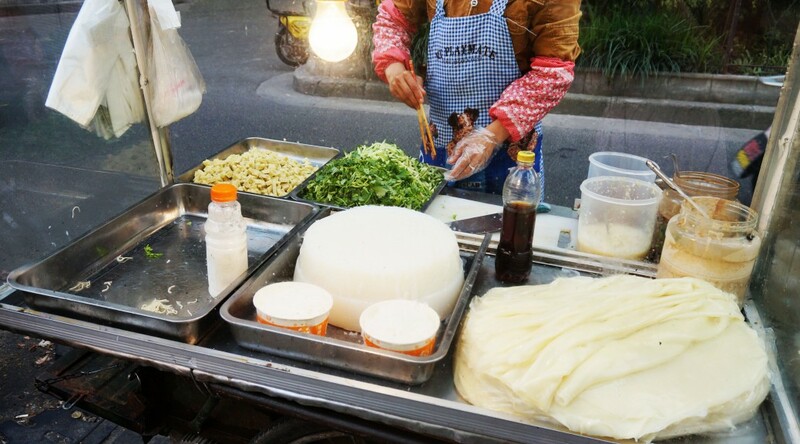 When the weather gets warmer, liang pi vendors can be found making this dish out of a glass box perched on top of a tricycle. Customers are given the option of rice or wheat flour or a combination of both to be tossed in with other components of the dish. Liangpi is typically sold for 6 to 7 kuai. Different types of liangpi can range in ingredients. Its noodles are either made from rice or wheat flour. The sauce combinations consist of salt, vinegar, chili oil, black sesame paste and garlic. Garnishes can include wheat gluten, julienned cucumbers, bean sprouts, cilantro and scallions. To make the noodles, the wheat or rice flour is turned into a soft dough by adding a bit of water and salt. The dough is “rinsed” until the water is saturated with starch from the dough. The remainder of the dough is then removed and the bowl is left to rest overnight in order to allow the dissolved starch to precipitate. The following day, a residue of starchy paste that sits at the bottom of the bowl is drained of the liquid that sits above it. A small amount of that paste is then spread out into a thin layer and steamed in order to make a “pancake” that is cut into long pieces resembling noodles. These noodles are placed into a bowl and tossed with various sauces and garnishes before being served. A folk story is told that takes place during the Qing Dynasty where ten acres of rice fields spanned Nanzheng County beside the Feng River. One year, the river had dried up due to the drought and the rice was poor in quality. People became distraught because they didn’t know how to pay their annual tribute to the emperor Qing Shi Huan. A man named Li Shi Er decided to grain the rice into a paste, steam it and cut it into strips. He then added some spicy sauce and vinegar to create Da Mi Mian Pi Zi, the original form of Liangpi. The people all made this dish for the emperor, expecting that he wouldn’t enjoy it. Everyone was pleasantly surprised when the emperor stated that everyone was exempt from the tax that year because he loved the dish so much. The preparation of liangpi became an annual tradition in that town since then.